We can’t wait to introduce Richmond, VA, to Glow Med Spa’s newest location on the southside. 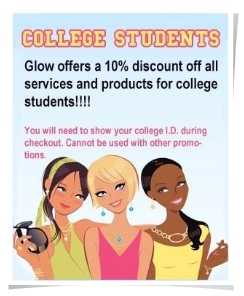 Glow Med Spa in the Westchester Commons will be opening any day now. Get ready for the same Glow you have come to know and love, but be ready for a whole new experience, too. 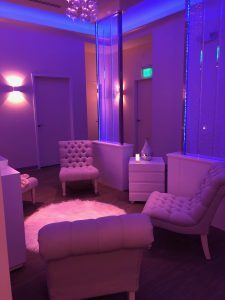 Come enter our newest Glow location to find yourself in an elegant and relaxing water environment. Greeted by a neutral colored waiting room that has teal/auqua marine accents, you will see aqua-marine lit domes with glass bubble chandeliers. 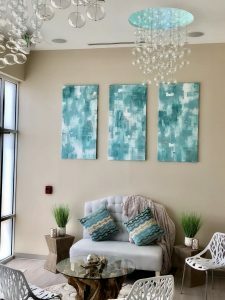 Water imagery slowly reflects on the wall behind the front desk, where our Spa Coordinators will check you in and serve you a glass of fruit or vegetable infused purified water or white wine, if you are over 21 and it is after noon. Think tropical area that is lighter and brighter! Once you enter the back treatment area, you’ll enter a world that is more serene with darker blue tones representing your voyage deeper into the ocean. The hallways are domed with beautifully blue cascading LED light that continues into the relaxing blue treatment rooms with glowing ceilings. Our Float Tank Therapy Sessions and Couples Massage sessions are exclusive to this spa location at Westchester. We can’t wait for it to open and for you to come see us! We know you’ll be glad you did. Whether you have been a devoted Glow client since we first opened our Northside Location in 2010 or if you’ve just heard people raving about our services and been meaning to try us out — you’ll be glad you booked an appointment at our new Westchester Location!